Sister Olivia give me back my Mr Quarterback from 1981! Anyway my buddies Michael Harris, Kevin Gipson and I turned on the Mr. Quarterback game. All I wanted to do was show my friends the new game before recess. That's all I wanted to do! Well I mistakenly started the game. You remember the Mr. Quarterback game. Once you turned the power on and hit kick-off all you heard was, Da Da Da Da Da Da, DAAAAAAAAAAAAAAAAAH then the little red light would go on and on, back and forth, across the screen until it stopped on the 5 or 10 yard-line. Then all you had to do was guide LED light past the opposing team trying to tackle you. Well I did know the rules! The rules were that if we brought a video game, a Sony Walkman, a GI-Joe, a Pulsar, Bruce Lee with the Kung-Fu grip, or any other toy or something that made us to have fun in Sister Olivia’s class, it would be taken and returned at the end of the year. That year was 1981 and I still do not have my Mr. Quarterback, my Hostess Twinkies, or my bag of new Jolly Ranchers. Sister Olivia took all of my goodies that day. All I have is the memories of third grade with my friends laughing at me at first, then feeling sorry that we didn’t have Mr. Quarterback to play that day at recess. I also have the memory of crying to my Mother when I got home and her giving me a whipping first for taking my game to school, then telling me, “That’s what I get”. Finally I have the lasting memory of my mother saying, “You are not going to get another Mr. Quarterback game and you better hope that Sister Olivia gives you that game back. 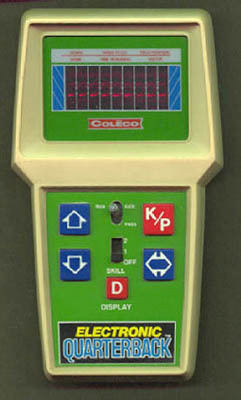 Oh well, 33 years later, my thumbs have the muscle memory of pushing those little red buttons back and forth as I would guide the LED dot past the other LED dots to score a touchdown against my other friends in Catholic School. Thanks for the memories Sister Olivia. I can get back the Jolly Ranchers! I can get back the Hostess Twinkies… I think! BUT I CAN’T GET ANOTHER MR. QUARTERBACK!